PSB aims high with 'luxury' noise-cancelling headphones | What Hi-Fi? PSB has launched its first pair of headphones in the form of the high-end, noise-cancelling M4U 2 over-ear cans. The Canadian speaker manufacturer says the headphones are the result of a "multi-year research program" at the Acoustics Laboratory at Canada's National Research Council. A closed-back design, the PSB M4U 2 headphones use a four-microphone active noise cancelling system to help block out a broader spectrum of noise. Claiming durable materials as well as a "strong design statement", the headphones also feature a monitor button allowing you to instantly pause your music to hear outside noise. Interestingly, the new PSB M4U 2 headphones also promise to not only reduce distortion from portable devices such as the iPod and iPhone but in so doing extend the battery life. Talking of battery life, the headphones themselves are battery powered and good for an impressive 55 hours or so of life and will also work in passive mode should you be caught short. 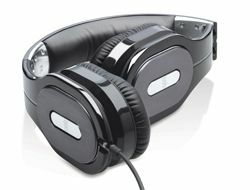 PSB supplies the M4U 2 headphones with a protective travel case, two accessory cords, plus stereo and flight adapters. Available in black, a white model is due in August. The new PSB M4U 2 headphones have a suggested retail price of £299.